Review by adalgrim of Toulouse, France. Eyepiece quality / price is great. This 9.5 mm eyepice is really what I expected. It is a bit big, but what you want, if you need light, you need aperture, you need diameter! Great use on my LX 90 8". I am not going to into any long review here, but I can honestly tell you that this is one of my favorite eyepieces. 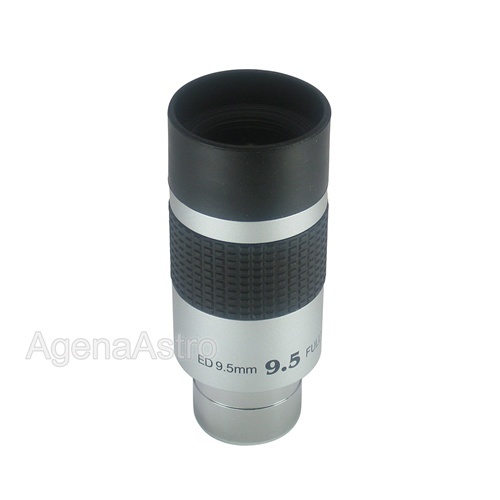 This eyepiece is very sharp, very well built, no false color, edge to edge is very good, and has very good eye relief. The Tak FS-102 and the Celestron 9.25XLT were the scopes used at f/10 and f/8.6. So for my scopes this eyepiece was very solid; the name of the game folks is clean sharp views. Yes the FOV is 50 deg. or so but for the price, and the eye relief and performance of this eyepiece, why go spend hundreds of dollars for something you really don't need, IMHO.